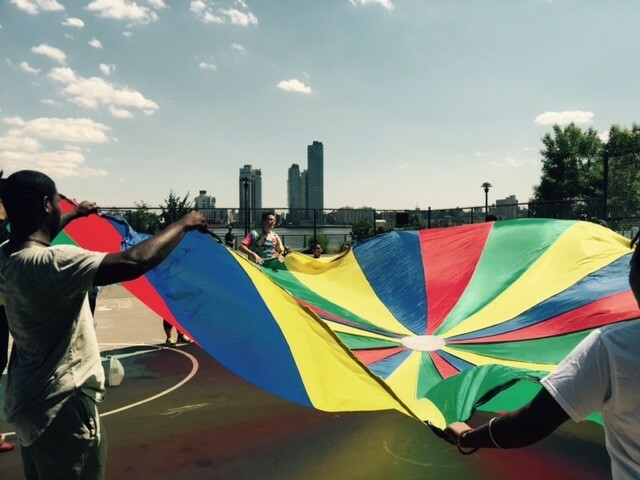 Parachute play is one of the most popular activity ideas that can be used in any type of program, both indoors and outdoors! 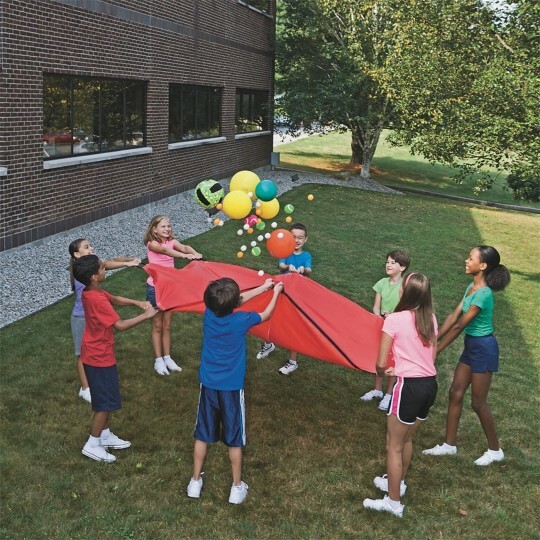 Below are a handful of ways to introduce the parachute to a group of children and get them working together as a team. Once you get the basics down, you’ll be ready to move onto more difficult and coordinated games. If you are looking for the best size and type of parachute for your program, view our selection here. Have children evenly spread out around the parachute and hold the edges. Have everyone gently tug on the parachute, holding it low between knee level and the ground. On the count of three,in unison, raise the chute upwards. It should fill with air, rising up like a giant “mushroom”. Work on getting the mushroom as high as possible, having each child take a step or two into the center, eventually running to the center while still holding the chute. If all children are synchronized and let go of the chute as it is in the air, it should maintain its mushroom shape and rise. Have children evenly spread out around the parachute. Students should all turn sideways, facing the same way with one hand on the parachute. Now walk, jog, skip, jump and gallop around in a circle. Switch directions and hands from time to time. The chute should look like a merry-go-round. 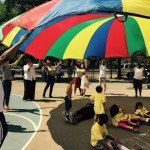 While playing mushroom and lifting the parachute up and down, call out two children’s names – they must run under the parachute and switch spots with each other. Have fun with this by also giving the children names of colors, fruits and vegetables, animals, birthday months,or whatever lesson you may be studying. 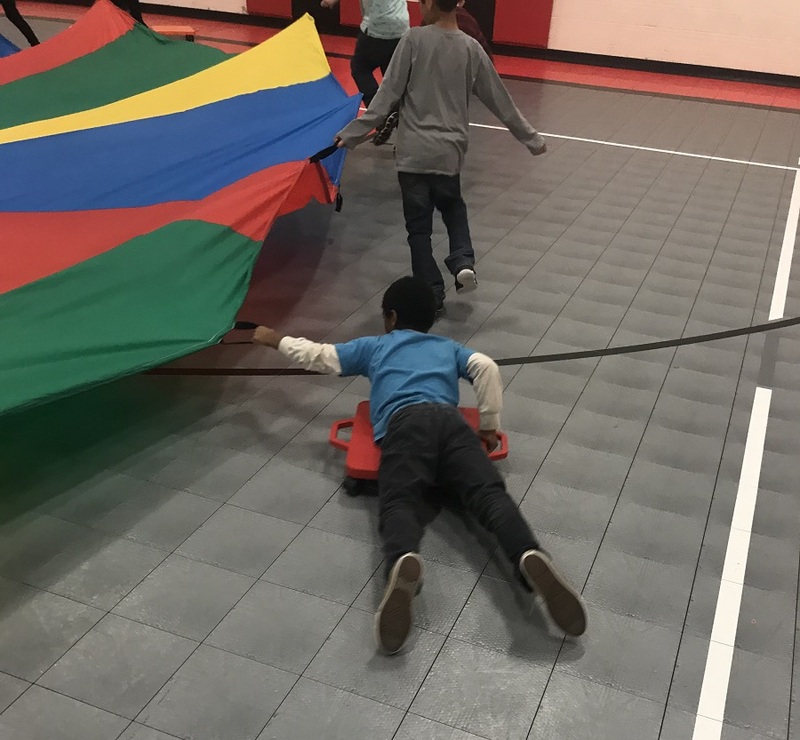 When you call the name or object, each student with that name will run under the parachute and go to an empty spot before it falls again. Children put their hands up in the air, lifting the parachute, one at a time like at a baseball game, creating a synchronized wave. 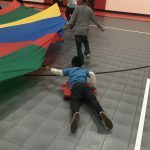 Have children create waves with the parachute to either the sound of music or on command of how fast or slow they should be moving their arms. 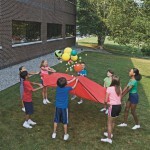 While in mushroom, all participants create a giant turtle shell while on their hands and knees underneath the parachute. Now everyone has to work together to get the turtle to travel around with its shell still afloat. This one is played while all children sit with the parachute flat, covering their bodies and pulled up to their chest. One or two children, dependent on the size of the group are chosen to be the “sharks”. The sharks must go under the parachute and try to grab people’s legs and pull them under. Those “captured” then become the sharks. 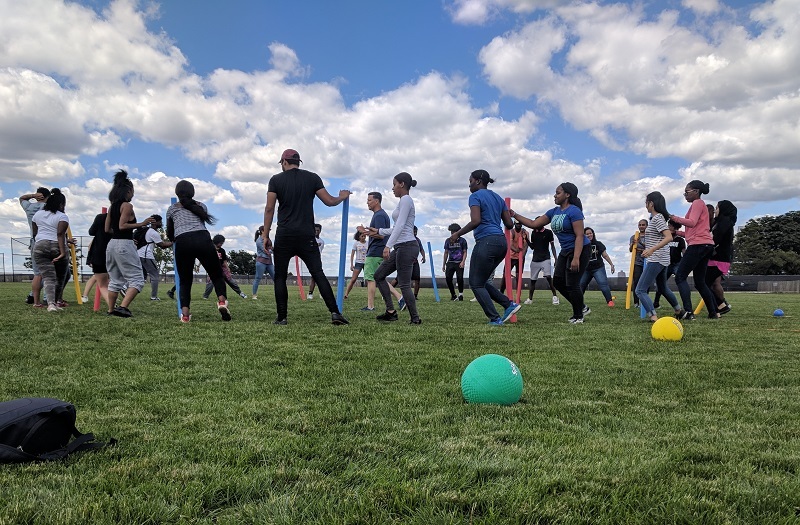 This entry was posted in Active Play, PE Activities & Games, PE Central, Summer Camp and tagged active play, Activities, after school, field day, fun, Games, parachutes, Physical Education, Tips by Angelina Petano. Bookmark the permalink.